Indeed, every time I set my oven above 400 degrees, I set off the smoke alarm. Since our house is newer, it’s equipped with a highly sophisticated smoke alarm that includes someone bellowing “FIRE! FIRE!” as well as beeping loudly for the whole neighborhood to hear. My kids and I have become experts at grabbing the dish towel and waving it under the smoke detector until it shuts up. But really?!? I’m just cooking. Children’s homework that signs itself when finished and correct. Garages that hold every bike, snow boot, ball, sled, lawn mower, snow blower, and hockey equipment bag and STILL have room for actual cars to be parked there. Packed lunches for school that are affordable, tasty, and nutritious. Oh, and if they could pack themselves that would be great, too. Some sort of magic paper sorting machine that knew what to keep (and had a place for it) and what to throw away. And so on and so forth. If I only had these inventions, life would be better! 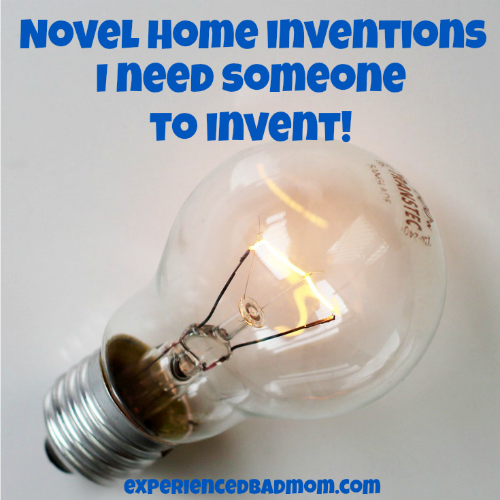 Tell me, what novel home inventions would you like to see? Linking up with Finish the Sentence Friday hosted by Finding Ninee and My Blog For Life. My little laudry packing it away robot is my 12-year-old. When he’s 13, he’ll become the washing and folding machine, too! Hallelujah. 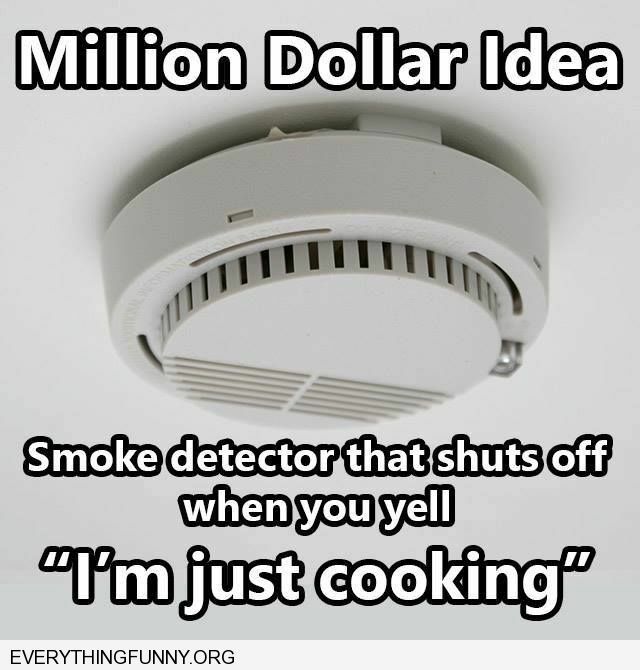 There must be so many of us setting off the smoke alarm while simply cooking that someone should be able to invent a good one that knows the difference! Hi Katy, we had a very similar fire alarm when I was growing up, except it just made a noise so high pitched it would wake up all the neighbourhood dogs and then some! I think you’ve got a nice selection of novel home inventions (hope you’ve patented them!). Personally I’d like to see self gleaming windows and a a kitchen that could rustle up good home cooked food without the need for a human. I was just thinking about getting my windows cleaned. Not by me of course! I’ve seen those things you attach to a hose and you just spray your windows but I doubt they work. Otherwise, everyone would have had them by now. I was really hoping you were going to include a washer/dryer that also folds your clothes. I wouldn’t mind putting them away. I’m hearing a lot of votes for the folding machine. Someone needs to get on that! An automatic filer. One that automatically sorts the “must keep” papers and magically files them away correctly. Bwa ha ha ha! Dinner time! you must right that story up as a Just Typikel installment soon. Uh, I meant “write” that story up. I’ll take one of everything you’ve mentioned, and two of the smoke detectors (and garages!). You know, you would think they would make a smoke detector that you could at least press a button to turn it off — hmmm, your next great invention?? Great list! Thanks, Wendy. Someone really needs to get on that smoke alarm thingy. Everyone is in the same boat! I’d love toilets that never clog! My kids are nasty and keep flushing. Amber recently posted…Hey, It’s Okay! I don’t know what it is, but my kids are always clogging the toilets. And of course they can’t plunge correctly! Oh my gosh I need all of this too, plus a really tall “thing- a-majig” to beat the crap out of our smoke detector when the battery decides to start squeaking at midnight! Those smoke alarm batteries ALWAYS die in the night! Someone needs to invent one that DOESN’T. A battery-only-chirps-during-daylight smoke alarm. Seriously, can a laundry folding machine really be that hard?!! I don’t think so. Someone really needs to get on that! Absolutely! My 12yo is getting closer to being his own folding machine, though! I’ve thought about inventing retractable Christmas lights along the gutters of our house, so that all we have to do each season is flip a switch and the come out, so we don’t have to take them down and put them up again. What do you think? I hope nobody steals the idea now that I’ve gone public with it . . .
I’m so sorry to burst your bubble but I swear I saw that retractable Christmas lights thingy on Shark Tank already. And none of the sharks went for it! Hell Yes to ALL of these! I especially love the one about the refrigerator tossing old food. And get a get a central comment station with a microphone that will remind me of the kids schedules (and them). Oh, and can it be the voice that constantly nagging them to pick up after themselves? I’m sooo tired of nagging! Yes, Allie, brilliant suggestions. I’ll add them to the list! Speaking of car doors that are ding-proof, when we lived in San Francisco, our bumper got dinged constantly. It was just a thing. Well last week in Brooklyn, and then again yesterday in our own town, we were behind someone with a bumper protector! I wonder if people really are inventing ding proof cars! Bumper protectors, ding proof car doors – it would be awesome! I’m not sure I could have handled the bumper dinging thing. But then again, I’ve never tried parking on so many hills like SF has! I agree with you on every single one. I also have never met a family who were all satisfied with the temperature of the house. I’d like a thermostat that I didn’t have to figure out for everyone to be comfortable. I’m sure it exists so let me add “affordable”. And dishwasher that automatically started once it was determined full would be great too. I had when i wake up to a dishwasher full of dirty dishes because I forgot to turn it on. We are notorious fall-asleep-pre-dishwasher-turner-onners. I’m with you on that one! These are awesome inventions! I’d like a machine or robot that cleans out the guinea pig cage too. It’s unbelievable how much mess those tiny things leave behind every day! Oh and the paper sorter. That would be amazing! Yes to the guinea pig cage cleaner! We have a cat and I know I’ve seen an auto pooper scooper cat box but it must not work as no one I know has one. All super ideas 🙂 but my favorite is baseboards that dust themselves. I can not tell you how that bugs me. But I’m not going to spend a day or two cleaning them. I should and that looks terrible to read it written. We are having company this weekend and just yesterday when I was cleaning up, I noticed all the baseboards. Some got a cleaning, especially the ones in the bathrooms. Others not so much. I remember when we moved into our new house I was so indignant that the baseboards got dusty. They were supposed to stay magicallly pristine on their own. Hmph! Hope you had a nice time with your company, clean baseboards or not! OHMYGOSH HILARIOUS!!!! YES to them all!! I want a magic motion detector that sense when we leave the house, so it can turn off the tvs, the lights, and anything else ‘on’- like ovens or coffee makers etc. Oh, and lock the doors! That’s a brilliant idea, Chris. I bet we are only a decade away from such “smart” houses, too! I need a kennel that can contain my Houdini Dog. He has been able to escape from three different versions so far. And then he tips the garbage can and smears dirty diapers and coffee grounds into the rug sooo this is a pretty urgent need. I keep saying if we just had more moms designing household appliances… Washing machines for instance. Old school, you turn the knob and pull it out. You can start mid cycle and just do a rinse if that’s all you needed. You could stop mid cycle to rearrange unbalanced clothing instantly. This new crap they have out, you can’t do that. You cannot start mid cycle if your life depended on it, and to stop? You hit a button, wait 5 minutes for the door to unlock… Ridiculous. Men design this crap. Men who don’t do laundry. Now how is that a qualification over mothers? Meanwhile, I want things that are already invented. If I ever can get to a point to build my own house, here are some of my requirements that probably won’t be that much more expensive than mainstream… 1. A restaurant grade dishwasher. 90 Seconds to do a small load, but 90 Seconds. 2. At least one HUGE cabinet in the kitchen because we are a family of 5, so all my pots and pans are huge. 3. A Walk-In refrigerator and freezer. So much easier than buying a second freezer. Easier to clean too. 4. A very sturdy shelf in my kitchen with plugs along the wall. Lots of plugs. Just one shelf for everything. Toaster. Blender. Mixer. Microwave. Coffee Pot. Deep Fryer. All in one place that you can use without moving. 5. A drain on my kitchen floor so I can just hose it down to clean it. Same with the bathrooms. 6. A walk in closet big enough to fit hanging clothes, chests of drawers, and a vanity plus it have drop down ceiling shelves for storage. 7. For my 3 kids, I want to design their bedrooms to connect with doors behind the rooms, like 2 rectangles first row and 3 squares (bedrooms) for the 2nd row, and then put a bathroom and walk in closet in the 2 rectangles for them to share. 8. I want a triple load washer and dryer like in the laundromats. I have more ideas, but these are the ones important to me. I both giggled and nodded in agreement with these. I think you should write your own post with all these ideas along the lines of “If Women designed houses.” I’d buy a house with these features! Can the machine that folds the laundry also put it away? Preferably better than my kids do (shove in drawer and leave it hanging open). I would also like dinner that cooks itself, and self-cleaning showers and toilets. Basically, I would like a maid and a chef, and maybe a chauffeur. Can someone get on this list of marvel inventions ASAP!! I could use them for sure. Especially a self-cleaning bathroom because nobody else here does it.. 🙁 womp womp! I’ve always thought it would be great to have a house that could expand when out of town guests come for a visit and contract after they leave – kind of like a pop-up camper. All of these. I am for ALL of these. ;P You invent them, and I’ll buy them!! Thank you for sharing at #FridayFrivolity – pinning and tweeting! Sarah Eliza @ devastateboredom recently posted…Capsule Wardrobe Inspiration – Steal My Closet! Casual, comfy, “indie” style mix-and-match minimalist wardrobe ideas!